A performance about icons, portraits and representation, about the internet - and the best rock song in the world. Video shows excerpts from live performance at Projectroom D7. Full lenght 20 min. Sep. 1st, 2011 [Review] On a day when the stock market continued to plummet I entered a cellar space in order to obtain a dose of comprehensible Avant guard art. They say that the consumption of culture increases in times of recession. Is this to escape? Or to find inspiration for new thoughts? 'It is just like in the 80ies”. In the cellar stood a woman with jet-black hair dressed in a snow-white suit speaking of the day she had her portrait done as a child. She deeply wanted to wear a pink dress but was portrayed in blue canvas overalls, as she was a farmer’s daughter. The artist can sing. Only the piece is not really dealing with music. It is about being present and vulnerable. 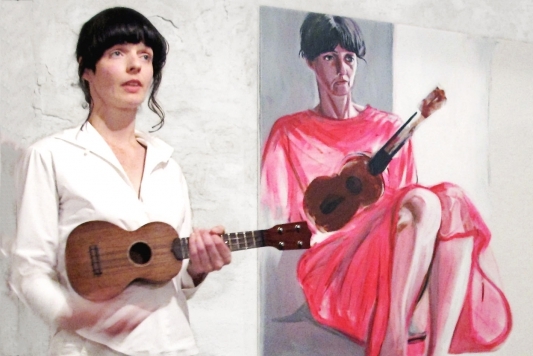 Molly in the paintings is exposed yet untouchable. She dares to expose herself, recount childhood memories and sing her favourite songs. In Maria Wandel’s paintings the display becomes complete. Portraits have dealt with issues of representation: How do you like to see yourself? Royals and ruling classes presented themselves in sympathetic ways. Yet the cellar display revealed the artist with such sincerity that it became a pleasant escape and a perfect end to a busy working week. The display was inspiring too, as the fragility surrounding it evoked personal longings. Currently discussions on performative practice are raised, also within visual arts circles. 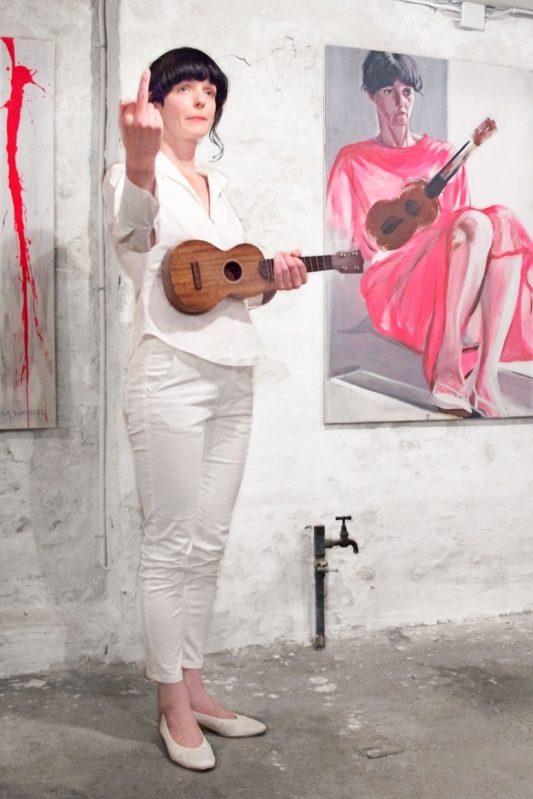 Maria Wandel and Molly Haslund are both trained visual artists but have, in this performance, incorporated a choreographed time and place based performance. 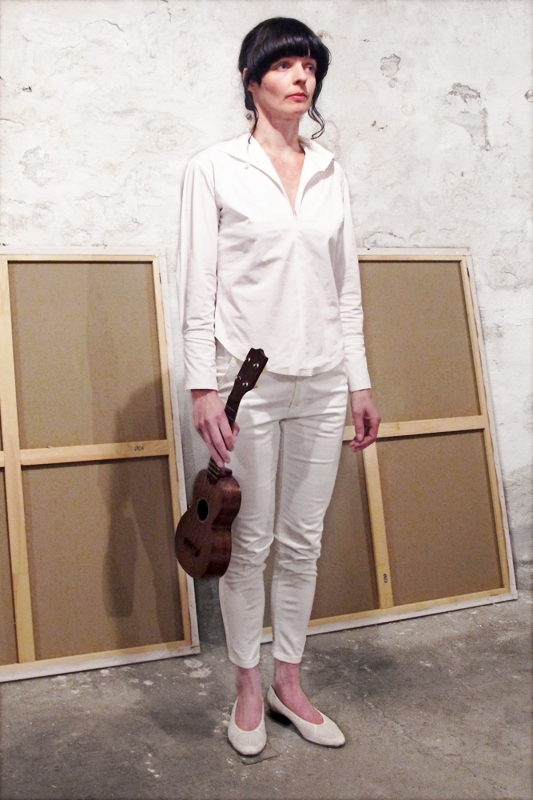 In fact Molly Haslund has chosen to make performance her main practice, though predominantly in visual art contexts. The display itself didn’t last more than fifteen minutes but their confidence intensified the sense of presence, as they performed this raw, pathos packed and symbolically dense rock song, Stairway To heaven by Led Zepplin. The song culminates in Molly, Maria, the female drummer and the male recorder player singing together. There was merely respect and applause. O. D. Death Prince performed subsequently and the guests placed their empty beer cans on sculptures from the exhibition. “It was just like in the 1980ies”, exclaimed several guests. Around fifty people in a damp cellar, munching salty snacks and buying drinks for one pound. It was a great party. Written based on the exhibition opening Friday August19th, 2011. 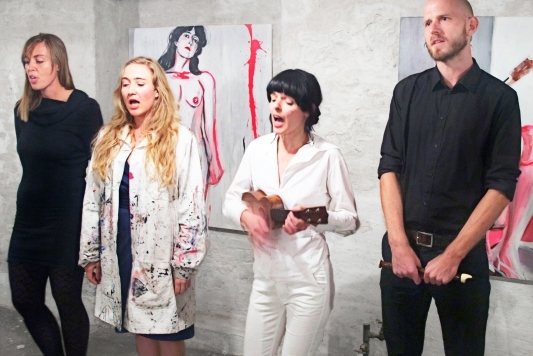 The artists will repeat their display on Thursday September 1st for a performance night at 6.30-9pm, free admissions. Carina Randløv played drums and Peter Tinning the recorder. Parts of this text were posted on the newspaper Børsen’s blog on August 25th 2011.